Sorry I haven't posted in a while. Nothing stopping me really just haven't had too much to tell ... but there's quite a bit to catch up on now! Following on from the last post, Captain G and Mr K spent two nights off the Kingfisher Resort at Fraser Island. The first afternoon they arrived it was planned to go ashore, have a look around the resort, maybe have a swim in the pool and enjoy a few beers. The weather wasn't in their favour that afternoon with one rain downpour after the other which meant staying on the boat for the evening or getting really wet. The next day turned out much better so they did some exploring of the resort and had the lunch and beers planned for the previous day. Then, on Friday, they made the crossing of Harvey Bay to the Port of Bundaberg. Captain G at the mast - with the MPS sail fully out - on the way to Bundaberg. They arrived in Bundaberg to meet up with a number of boats from the Yacht Club as well as Southern Belle's sister ship - Sabbatical II - with Greg and Heidi. The next rendezvous for the club was scheduled for Saturday night. After help tieing up to the berth from club members and a visit from Greg, Captain G and Mr K joined club members for drinks and then went on to a very welcome dinner ashore and a quiet night. Bundaberg, and it's surrounding infrastructure, was one of the places hit hard by the Queensland floods over the past couple of years. Before we left Sydney there was talk and concern about the marina and its ability to still host yachts. Fortunately they have repaired much of the area but Captain G told me there are still many wrecked boats visible all along the opposite shore. Below is a picture, from Flickr, of just how much of the marina was washed away back in Jan 2011. In 2012 they had another flood - but not quite as bad. Its been a very tough time for Queenslanders during the tropical months for, what seems like, year on year....I'm sure they'd like a break now please! 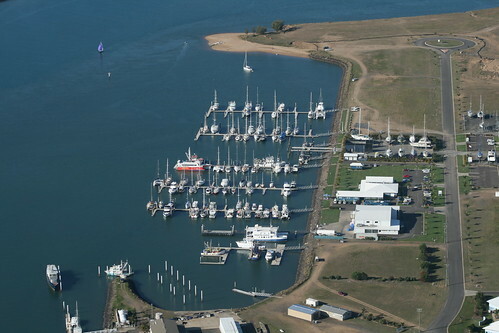 Bundaberg Marina after Jan 2011 flood. On Saturday, June 15, Mr K left to fly back to Sydney early in the morning. 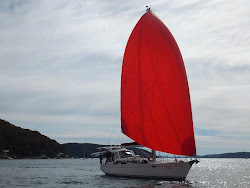 Captain G would be on his own until Roslyn Bay and Yeppoon the following weekend. Captain G enjoyed the rendezvous on Saturday night and then went to the local markets on Sunday with Greg and Heidi. That night as we were talking on the phone he suddenly exclaimed, "there's a sea snake swimming around the back of the boat!" He's getting really close to the tropics now with sea snakes on the surface and so close in shore. Monday morning it was time for the long trip from Bundaberg to Pancake Creek - just behind Bustard Head headed north. The forecast was for very calm conditions and little wind. This was going to be a long haul of about 10 hours and - again because its what I do - I was worried about the Captain being on his own for the journey. Not because he isn't up to it - goodness knows he has certainly proved he is a very good skipper - but because sometimes when the weather is calm you can let your guard down a bit. But, as usual, he did a great job and called at 1530 to say he was anchored up and having a beer. We heard about/read about a fantastic hike up to the lighthouse on Bustard Head (called that because Captain James Cook supposedly ate a bustard bird there and named the headland after the poor thing) but since I wasn't there Captain G decided to spend only one night. The plan for Southern Belle is to stay at the Island for the night and move on in the morning to either Great Keppel Island or Roslyn Bay....and that's where I meet them and resume my part of the cruise! I've booked my ticket back to Captain G and the boat this Saturday!!! I see the doctor on Thursday and, hopefully - since its been 6 weeks tomorrow, I'll get an OK to do some walking on my foot. I'm not really expecting to get a clean bill of health since the break was so severe but I think I can at least give up the crutches. That's what I'm hoping for ... if I can at least walk I'll be right to climb aboard and get into that tropical sunshine!